Note: I will be updating this post whenever I find a tool that could impact your workflow and help you work faster. So, bookmark this page so you can check it later. Maya is my favorite 3D program. Coming in a close second is now Motion Builder. Sadly, the one that was my favorite is now third in my rankings. That's 3ds Max. This is mainly because I find that my workflow is slower than with any other software. Some tools (in my opinion) are poorly designed and they impact my workflow. However, there are some things you can do to speed up and enhance your workflow. This set of hotkeys will increase your workflow so that all the playback controls will be together. 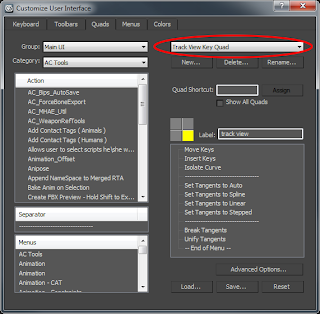 - Change the default Next/Previous Key hotkeys (by default, they are assigned to the "," and "." keys) to the Left and Right arrows. 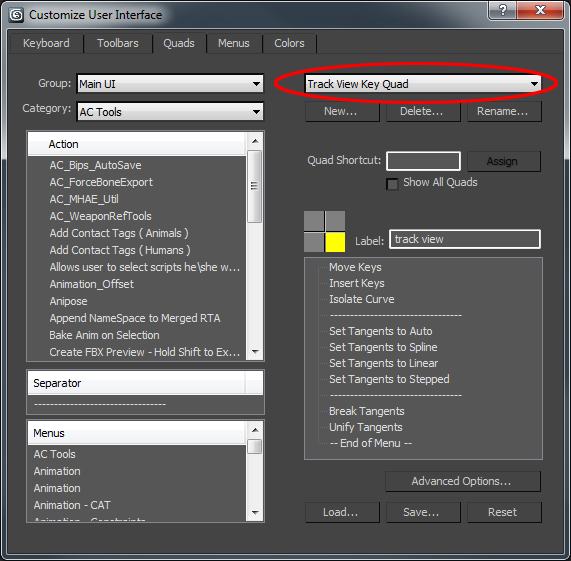 - In 3dsMax and map the KeyMode Toggle function (known as "NextPrevious Key Mode Toggle") to the Down Key, so that you can easily switch between Next/Previous frame to Next/Previous Key. - Change the hotkey of the UP Arrow key to play the animation. These set of changes in the Quad Menus will greatly improve your zooming workflow in the graph editor, making it a bit friendlier. First, let's find the correct quad, since there are a couple with similar names. I added a couple of zooming and key-moving tools to help me out when I'm working on the Graph Editor, which is, like, all the time. Where to put the tools is up to you. I place them in that particular order for no reason really. You can do the same or find some other one that suits you better. The Zooming tools (Values and Time) will help me zoom in one specific direction at a time. The Move Key tools do the same thing but with selected keys. So, Move Keys Horizontally will move keys in time only, while vertically in value only. NOTE: CTRL + SHIFT + Zoom Tool will disable the default proportional zoom of the tool, hence achieving the same effect but I feel you have less control over the zoomed area. If you want to enable most of the hotkeys so they also work while the Curve Editor (or any trackview, for that matter) just activate the Keyboard Shortcut Override Toggle (toaster button). If you already don't know about Eric Legaré DTools, then you're missing a lot! Especially the trajectories tool called DTrajEdit. Basically, it's like the default trajectories, but better. You can even attach a trajectory to a polygon on your mesh! How cool is THAT!? A friend of mine just shoot me a link about a "Tween Machine" script for 3dsMax. If you don't know what that is, it's basically a tool that existed in Maya (a script made by someone) that allows you to easily add inbetweens into your animation. Well, it happens that artist Michael Smith created the same tool for 3dsMax. Head over his website and check out his tutorials.